While the moose is the most iconic animal in the Adirondacks, the Adirondack chair is the region's most recognizable object. Although there are all kinds of variations today, ranging from colorful plastic chairs to two-person benches, the original design for the Adirondack chair was created back in the early 1900s and lives on in today's popular Adirondack chair designs. The history of the Adirondack chair begins in the Town of Westport, NY with the inventor of the Westport chair - Massachusetts native Thomas Lee. Lee's family owned a house in Westport, and he spent many of his summers there around the early 20th century. In an interview between the Sun Community News and Thomas Lee's great-great nephew, it was revealed that Lee came from a wealthy family, was a Harvard graduate, but then dropped out of law school because he preferred to work in nature and felt at home in the Adirondacks. As the story goes, during one summer in Westport, Lee felt a desire to create a chair that could handle the rugged terrain of the Adirondacks. This chair would have to be sturdy, balanced, and comfortable on everything from sandy ground to a small hill. From 1900-1903, Lee worked on making this new chair. In order to perfect it, he had his family members test out each prototype before moving on to the next. Eventually, Lee came up with what he considered the perfect chair: wide armrests, a high back, and a slanted seat (the seat and back were made from single pieces of wood). Soon after Lee finalized the design of his Westport chair, he met up with his hunting friend Harry Bunnell, who owned a carpentry shop in the town. Bunnell was worried about the upcoming winter because of a lack of resources that year, so to help him out, Lee gave him the chair's design. Bunnell began to build and sell these chairs to the surrounding community, and he soon noticed how popular they were. After modifying the design to make the chair a little narrower, Bunnell patented his Westport chair design in April 1904. While some stories depict Bunnell in a negative light for patenting the chair, Lee's great-great nephew noted in the Sun Community News story that Lee was already wealthy, so he wasn't interested in starting a chair-making business. Indeed, Lee was more focused on bottling and delivering mountain spring water from the Adirondacks. Over the next 20+ years, Bunnell developed a successful Westport chair-making business, and he left his signature on each one. The Westport chair grew in popularity because of its durability and high comfort level, but as the years passed, the design began to change into the modern Adirondack chair. The best explanation for the design change is the difficulty in mass-producing chairs made from a single, knot-free plank. To make construction easier and sell their own chairs, different carpenters began to innovate the Westport chair design. 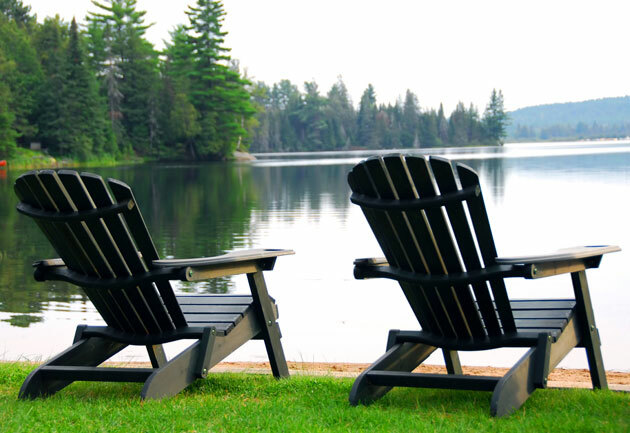 Both the Westport chair and the newer Adirondack chair feature extra-wide armrests, high backs, and slanted seats. However, the seat and back of the Adirondack chair are made out of multiple slats of wood lined up; the Westport chair was built from whole pieces of wood cut from a single, knot-free plank, which made the design harder to construct. The popularity of this updated design spread, and because the chair originated in the Adirondacks, it was widely-known as the Adirondack chair. The exception is in Canada, where the chair is called the Muskoka chair, likely due to its popularity in the Muskoka region. In 1938, Irving Wolpin of New Jersey acquired a patent for another design change. Described as a "lawn-chair," Wolpin's chair had the slanted seat and wide armrests of the Westport chair, was constructed out of smaller slats, but also featured a rounded back and contoured seat. Wolpin's design is the most commonly replicated Adirondack chair today. Today, the Adirondack chair is one of the most popular and iconic lawn and beach chairs. Although it exists in many forms, each one is still inspired by the original Westport chair.